Video episode #197, for 5 Napkin: Buffalo Trace White Dog. High Wine, Everclear, Georgia Moon, White Lightning, woo hoo! New Holland's HATTER ROYALE HOPQUILA. Hey There folks! Loud Guy and Communicator Guy in Michigan, checking out the craft industry. 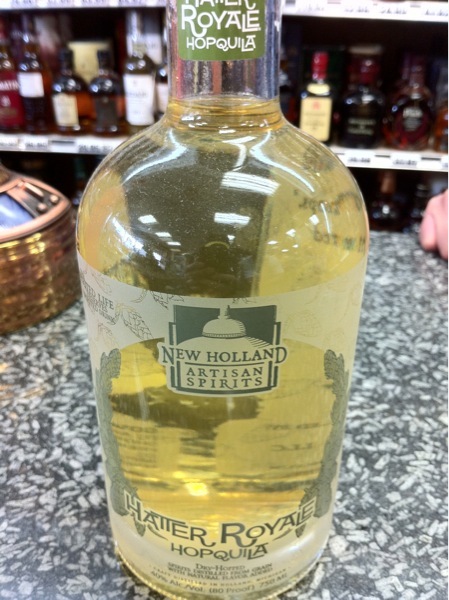 Our newest snooping has led us to a store in Brighton, Michigan which stocks New Holland's Artisan Spirits line. Their HATTER ROYALE HOPQUILA is a "fermented wash of 100% Barley, twice distilled, then steeped with Centennial hops." So the QUILA moniker is a tad misleading - it's actually a hop-infused grain liquor. Sort of a hopped White Dog. And upon tasting, we can report that EVERY HopHead should have this in their home arsenal. The hop character is not overwhelming but suffused throughout, and really raises the malt whiskey character to another level. Wonderful stuff! Stay tuned for further updates. Cheers!